Can You Use Coupons When You Pay With Cash for an Online Order? First you might need a little background. Walmart has an option that will allow you to pay cash for online orders. It’s an incredibly handy option if you don’t have a credit or debit card or just don’t want to charge a purchase. This is nice if you are buying a gift for a significant other and don’t want them to see any charges on a shared bank statement. Several years ago I wanted one thing as a gift from my wife, a Kindle. I was checking our accounts and noticed a charge to Amazon I didn’t recognize. I checked her Amazon account and sure enough she had ordered me a Kindle. I was excited but I played it cool. My birthday is at the end of November and the Kindle was arriving just before that so I assumed it was for that. As the day approached I got so excited but I had to make sure she suspected nothing. Then my birthday came and went with no Kindle. That’s when the awful truth dawned on me, she had bought it for Christmas. I had to go another month KNOWING that what I wanted was somewhere in the house and had to act like I wasn’t dying from anticipation. If Amazon had a Pay by Cash option, none of this would have happened and I wouldn’t have had to undergo what was essentially Chinese Water Torture but instead of water, it was the knowledge that my gift had arrived but I couldn’t use it for a month. 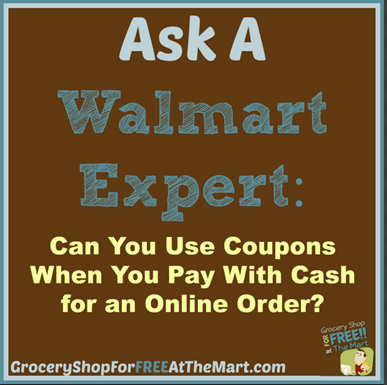 To use the feature, look for anything on Walmart.com that has Pay by Cash as one of the payment options. Once you select it, it will email you something to print out with a barcode. Take that to your local store, let them scan your barcode, pay the total and you are done! At this point your order will be shipped like a normal order. Can I Pay for it With Coupons? Walmart has an entire page in their Answer Center devoted to what payment methods can be used and it specifically excludes coupons, WIC, and SNAP. So unfortunately, your dreams of ordering 100 of that thing that was going to get you overage isn’t going to work.